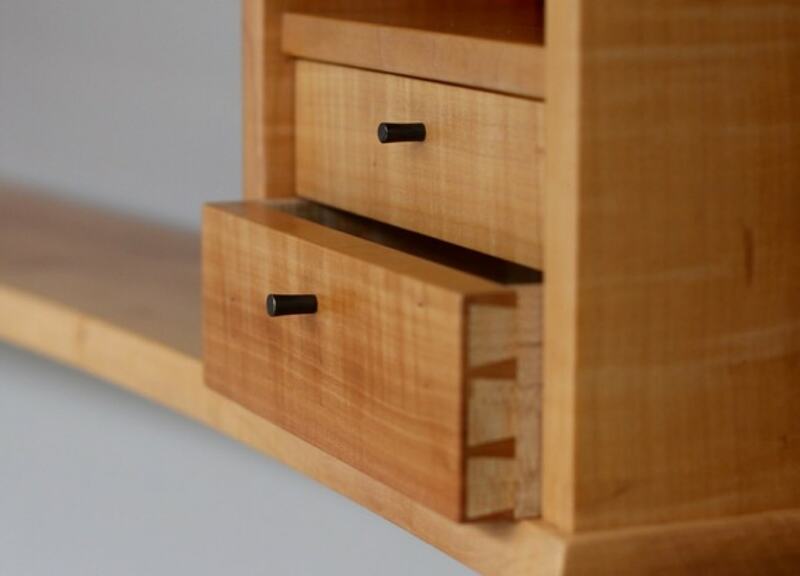 Commissioning a piece of handmade furniture is an exciting, collaborative effort between maker and client. I welcome inquiries form individuals, institutions, designers, and architects. I work with clients to design and build original pieces that have just the right look and feel they are after. From jewelry boxes to rowboats, if you have an idea for a piece, I would love to hear from you. The process can begin with a sketch, or more often, just a general idea of what you might have in mind. Maybe you have a funny spot in your house that you haven't been able to find anything for, or maybe you'd like to commission a piece for a special someone. One of the first things we discuss is wood selection; to me, finding just the right kind of wood for a particular project is absolutely paramount. Once the overall scope of the project has been finalized, I will sketch or draft a few possible designs, or possibly build a full-size mockup. Once a design has been finalized and approved, materials are purchased and allowed to season in the shop. Throughout the construction process, I invite all clients to visit the shop as often as they like to check the progress of their heirloom. 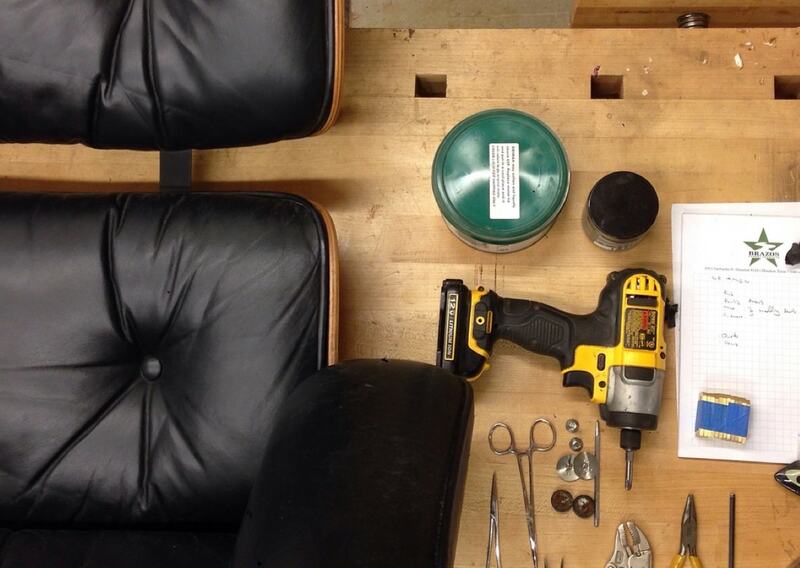 The Eames Lounge 670, better known to many as simply the "Eames Chair", is a design classic. This chair has been in continuous production since 1956, and for many people this chair is the centerpiece of their living room or office. Unfortunately, with time the rubber "shock mounts" that connect the back and arms to the seat can (or more accurately, will) become brittle, causing the glue on the shock mounts to fail and the upper and lower halves of the chair to separate. The good news is that this is a fairly common problem - what I tend to tell people is that it is not so much an "if"-problem as a "when"-problem. (Think about it like the timing belt in you car.) The better news is that the repair is relatively straightforward. Essentially, the old shock mounts need to be removed and replaced with new ones. Once the new mounts are in place your chair should be ready for another few decades of use. Lettercarving in wood has a long and rich history, but sadly today it is an almost forgotten art. Cutting letters by hand is a demanding process requiring skill and patience. That said, there is simply no substitute for the results that can be had with mallet, chisel, and gouge. There is a crispness and a subtlety that cannot be matched by machine. Hand-carved letters are a great way to commemorate special occasions. Names, initials, dates, or inscriptions all work well as carved letters. Some past lettering projects have included house numbers, dedications, awards, and signs. For an additional fee, letters can be gilded with 23k gold leaf. Please have a look at a few lettering samples, or purchase some letters at my store. I look forward to working with you on your next lettering project.